Over the past couple of weeks we survived extremely cold temps and some great winter storms which left over 12 inches of snow in our front yard, and the weather forecasters are telling us to prepare for more cold and snow during the upcoming week, but… today was absolutely gorgeous! And we did our best to take advantage of it. We were greeted by the sun streaming into our bedroom as we awoke – a rare sleep-in in our household. It was 7:30 am. It seemed to be the perfect morning for waffles, so, after our first cup of tea, I reached for the recipe and got started.. Over breakfast we discussed our options and decided on a game plan that included a trip to Rickett’s Glen for a hike, after which we would stop by my in-laws’ to take a shower and then on to school where we are currently holding down the fort in the student center till 11 pm. Well, after beating me in two games of ping pong, my wife is snoozing on the couch while I do my best to keep my eyes open till the appointed hour! 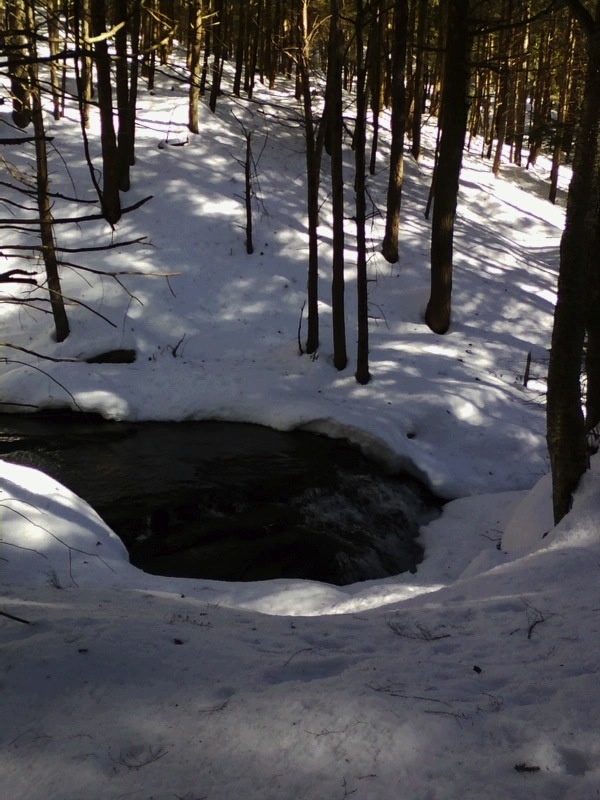 Rickett’s Glen is known for its hiking – the falls path is particularly popular, but it is closed at this time of the year unless you happen to be well prepared with gear to handle dangerous, icy conditions. It was not our intent to tackle the falls trip during this outing. Instead, we thought that we would venture off in a new direction. The park covers 13,000 acres. 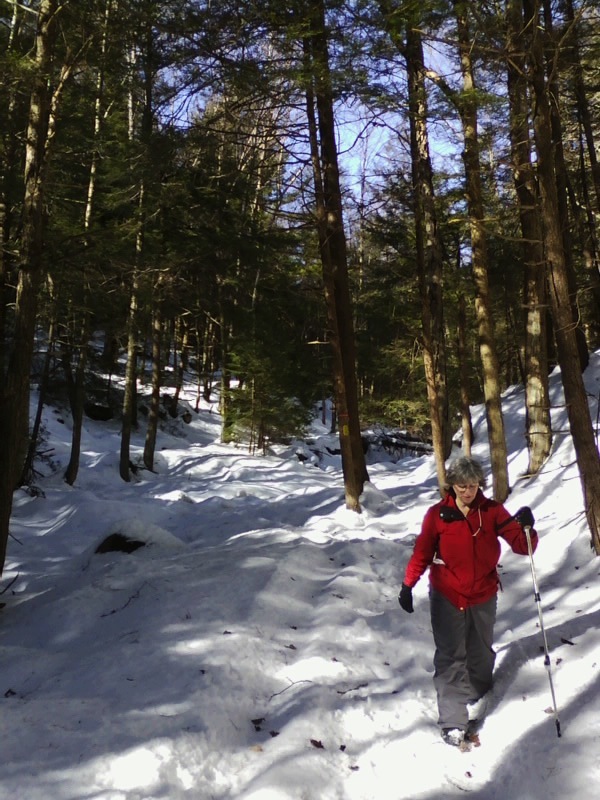 Along with a great deal of hardwoods, the park has a considerable amount of hemlocks as well. We love the color that this adds to what is otherwise often a bleak winter landscape. When we stopped in the office, the person behind the desk suggested the cherry run trail and pointed out that a new cut-off trail would make for a 5 mile loop. The cut-off trail was not on the map that we were looking at, but she assured me that it was well marked. I have to say that the park appears to be well-managed, and the trails are, indeed, well maintained and marked. 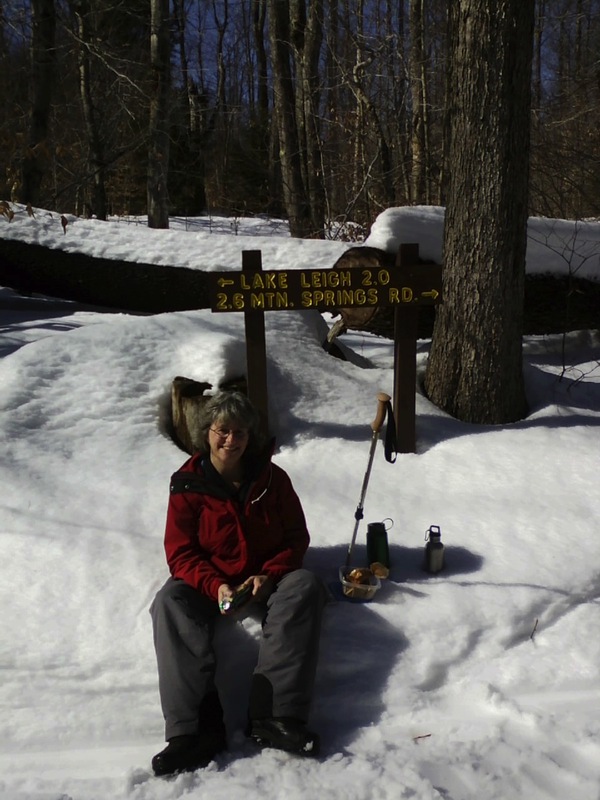 During the afternoon, we ran into just two other hikers and two folks on snow mobiles. Other than that, we had the whole area to ourselves.. at least that is how it seemed. 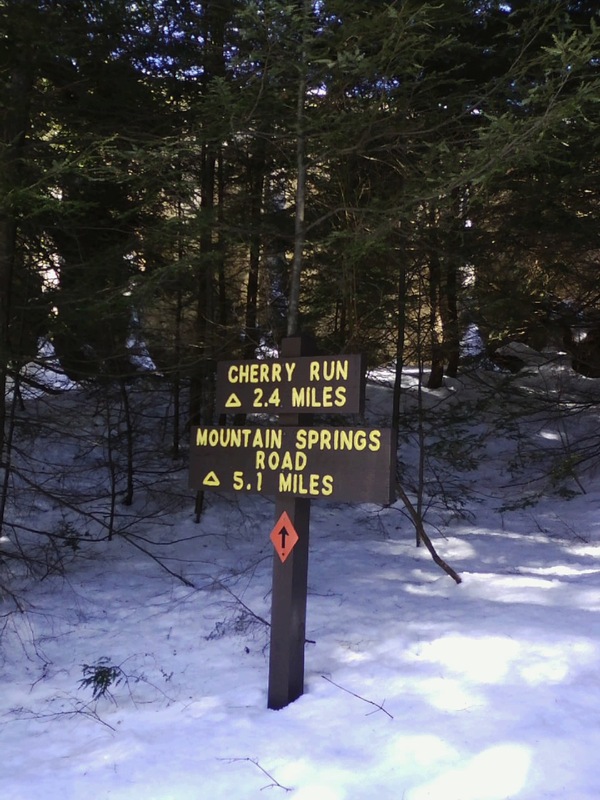 so the plan was to take the cherry run trail out to the cut off.. follow the cut off to the mountain springs trail which would bring us back to the junction. The first segment was 2.4 miles. We were happy to stop for a break and a snack after completing it! 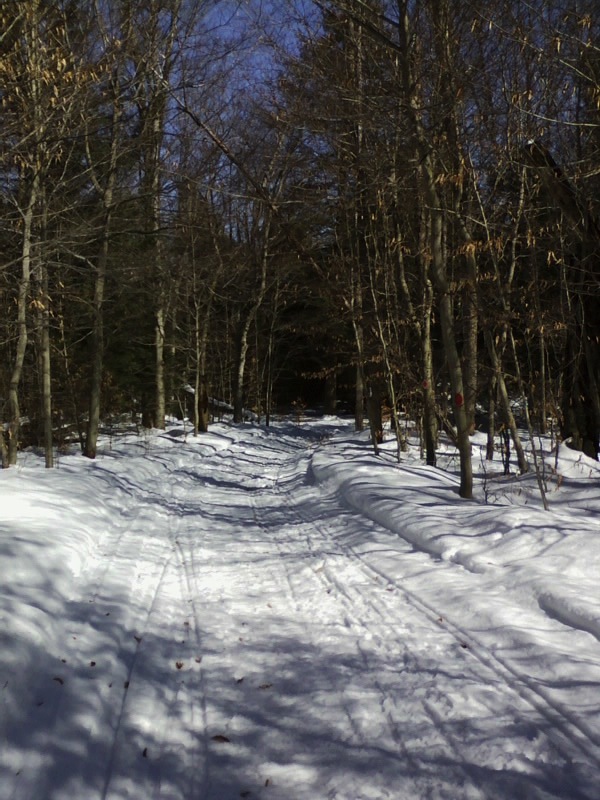 The cut off trail was a bit more challenging because it has seen less use since the last major storm. It was well worth the effort, however. The scenery was just beautiful. Much of the path followed a steam which we needed to cross at least twice.. a nice new bridge helped us to manage one of the crossings, but we relied on stepping stones and our poles to deal with the second one. 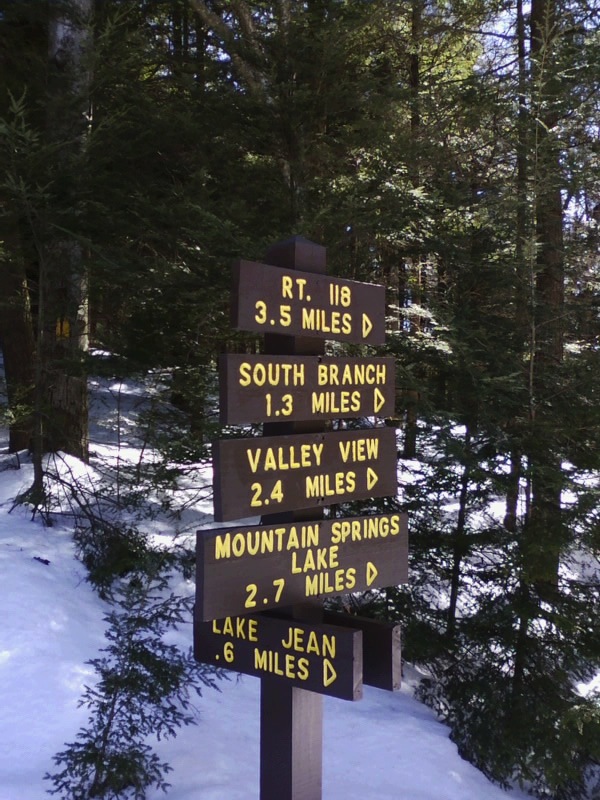 Once we reached the return trail, we had to pay for all of the downhill sections that we had enjoyed, and, of course, this was about the time that we began to notice the weight of our heavy snow boots, and also when it dawned on us that the 5 mile loop did not include the .6 mile access trail! But we took our time and we made it back to the parking lot with at least a little energy to spare! It is a snowy day here in north east Pennsylvania, and what better activity than to bake! 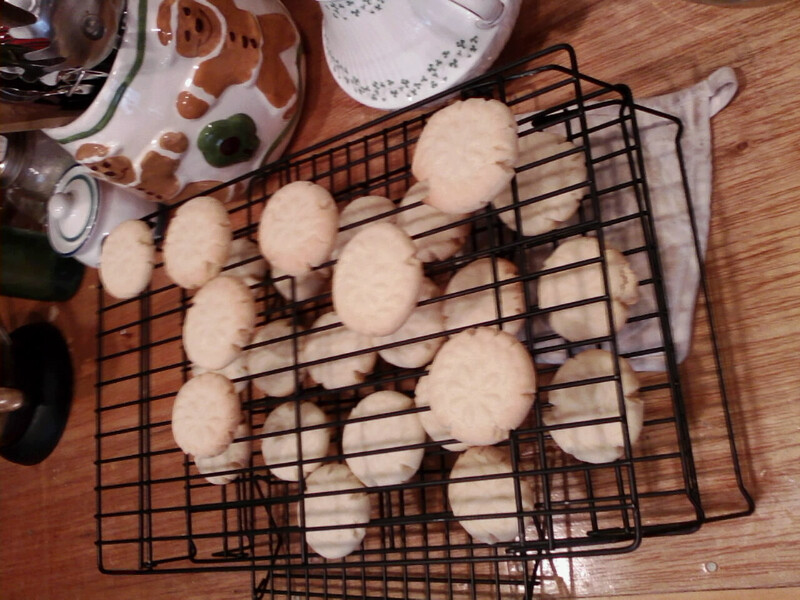 I was in the mood for something quick and tasty, so I whipped up some shortbread cookies.. I don’t know of too many recipes that are easier, and I still enjoy deciding what cookie press to use. And what are the three essentials of life? flour.. butter.. sugar yep.. that is the extent of the ingredients.. although I did augment the batch today with a half teaspoon of almond extract – what a nice touch! making progress on the boat! It may be a while before I can begin the next step. 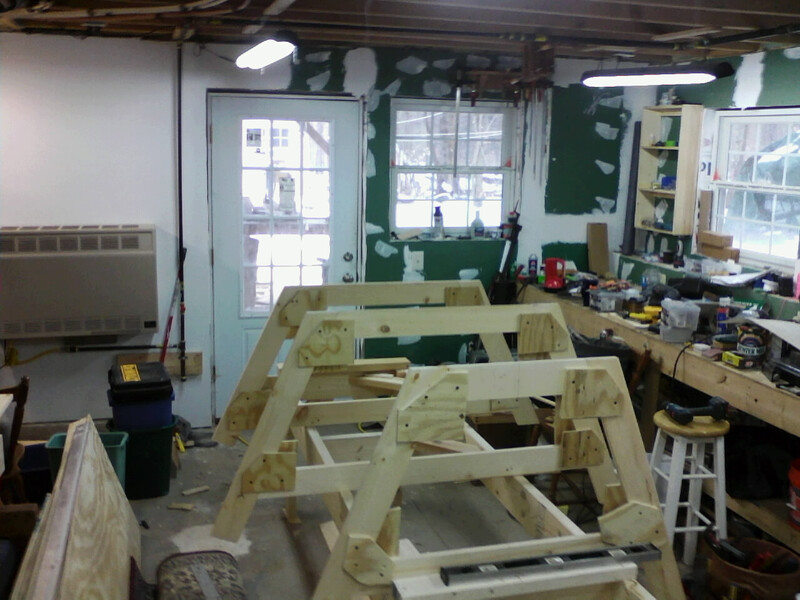 I called the lumber company and ordered the materials that I need for the stem, transom and planking. It may take a week or so, but it will be good quality, so it is worth the wait. Along with the plans for the boat that I bought so many years ago, I also bought the companion instruction book from Walt Simmons. In his introduction, he states that the building sequence is split up into 40 one hour tasks and then shows his teenaged son and a friend working on the boat. He reports that they completed the boat in a week and sold it the next day! Well, I am already well behind the pace set by those young lads! But that is ok. I will be combining some of Walt’s methods with techniques that we learned on the first project back in NH. That boat was “Daisy” designed by Harry Bryan. Anyone who might be interested in boat building would be well served to look up Harry’s web page and read his story – what a fascinating character! We tried to beat the rain this morning – decided to investigate another trail system that is close by, perhaps a 9 mile drive or so to the trailhead. A group of 4 hikers started about 75 yards in front of us. Other than that, we did not run into another soul. Before we left, Janet reminded me that I had mentioned digging out the GPS from the boat stuff. I put fresh batteries in it, and then we were off. 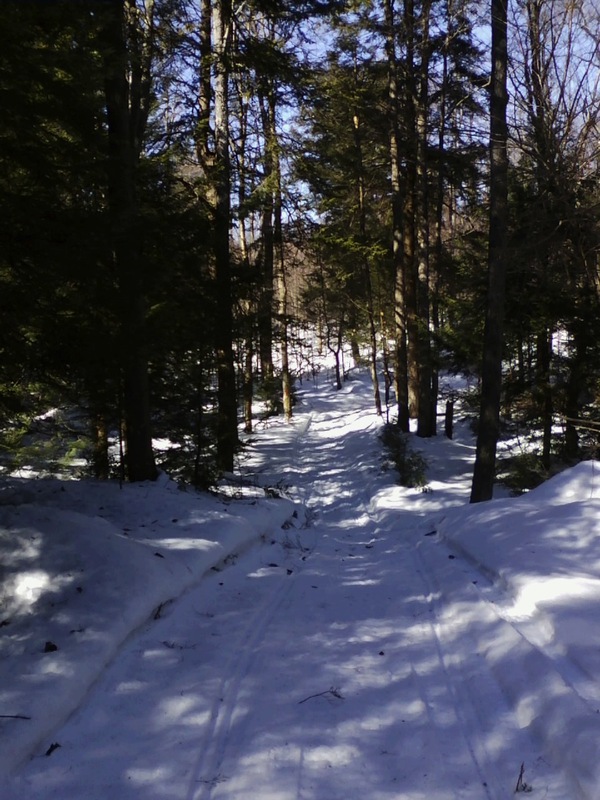 The trail is a 23 mile loop with a number of side trails. Our map showed the side trails were blazed in red, but I guess that they have recently been re-done in yellow. We opted for a smaller loop which I estimated to be around 3 miles. There were a few drops in the air as we were leaving, but nothing too threatening. 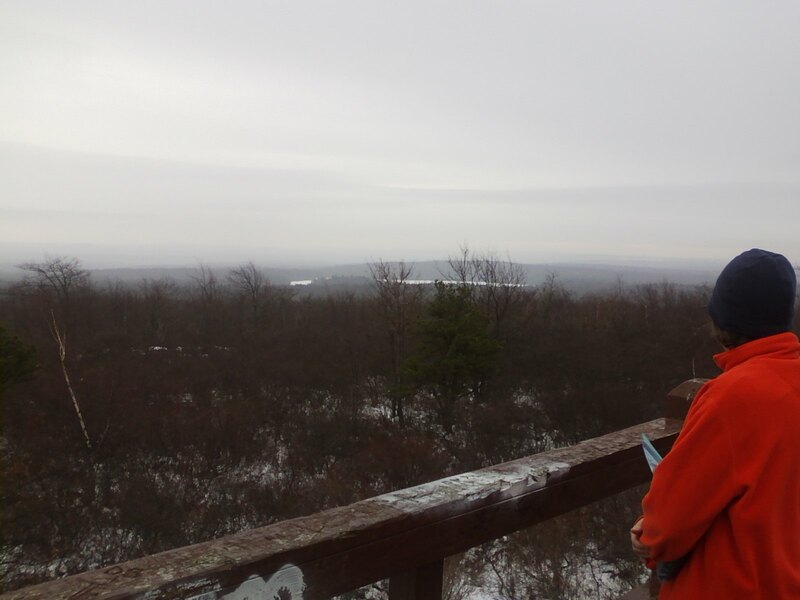 By the time we made it to the observation deck, around 1.4 miles, it started to drizzle. We decided to return the way we came rather than to risk a longer route since we were not exactly prepared for rain. There was time to enjoy a drink and a snack at the observation deck. Then we turned back and completed the hike before we got drenched. All in all, we completed 3.2 miles, and we were pleased about discovering another excellent trail system close by. 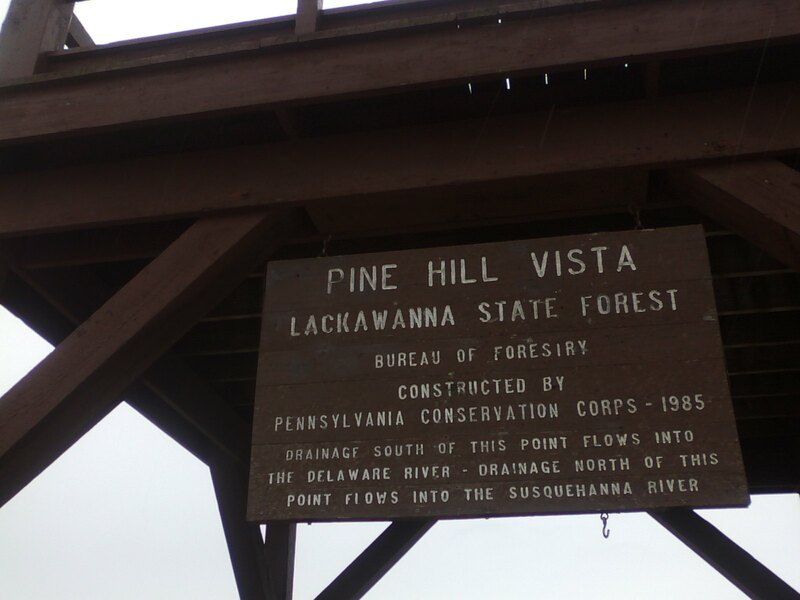 Unlike the bear creek preserve, it is permissible to backpack and camp on the Pinchot trail. Perhaps we will try that out this summer!